Mark Thomas DeRosa (born February 26, 1975) is an American former professional baseball player. DeRosa primarily played third and second base, but started at every position other than center field, pitcher, and catcher. DeRosa was selected by the Atlanta Braves in the 7th round of the June 1996 amateur draft. DeRosa currently works for MLB Network as a personality on MLB Central. DeRosa was born in Passaic, New Jersey. He grew up in Carlstadt, New Jersey and attended Bergen Catholic High School in Oradell, New Jersey where he earned all-state honors in baseball and in football. He graduated from the Wharton School of the University of Pennsylvania in the class of 1997, where he started at quarterback in the 1993–95 seasons and played varsity baseball from 1994 to 1996. He was originally pledging The Phi Kappa Sigma Fraternity when their charter was revoked. This resulted in his pledging the Sigma Chi Fraternity and in 2009 he was honored by being named a Significant Sig., an award given to Sigma Chis who have achieved distinction in their professional fields of endeavor. DeRosa was also one of six Ivy Leaguers on major league rosters at the beginning of the 2009 season. DeRosa was drafted by the Atlanta Braves in the 7th round (212th overall) of the 1996 Major League Baseball draft. He made his MLB debut on September 2, 1998 as a shortstop. From 1998 through 2001, DeRosa spent much of his time as a backup utility player, playing both infield and outfield. In 2002, though still playing as a backup, DeRosa was starting to play more and more, and enjoyed a successful batting average of .297. DeRosa started the 2004 season as the starting third baseman for the Braves. He had been strictly a backup the previous bunch of years, but the departure of Vinny Castilla opened the spot for him. His performance as a starter was widely considered unacceptable. DeRosa himself spoke openly of his poor performance, declaring in one interview that even his mother could not tell him she thought he was playing well. After about a month, DeRosa was demoted back to a backup. Chipper Jones moved from left field to third base, where he had played his whole career until 2002. Jones was replaced in left field by a platoon of Charles Thomas, an unknown rookie, and Eli Marrero, a fairly obscure catcher/outfielder who was considered the much less important half of the trade in which the Braves acquired him and J. D. Drew for pitchers Jason Marquis, Ray King, and Adam Wainwright. At the end of 2004, the Braves declined to offer DeRosa a contract for the 2005 season. After the Braves declined to offer DeRosa a contract, he signed with the Texas Rangers. He logged little playing time due to injuries in 2005 which delayed him from playing in the starting lineup. Finally healthy in May 2006, he received the opportunity to start. DeRosa responded to this by hitting well over .300 for the first half of the season. At season's end, he topped his career high in RBI with 74, eclipsing his previous career high of 31. DeRosa also set a career high in home runs, with 13, and batted a respectable .296. He set a career high with getting 40 doubles. On November 14, 2006 he signed a three-year, $13 million contract with the Chicago Cubs. DeRosa's signing was one of several off-season acquisitions by the Cubs in their spending spree. He was a pleasant surprise at the plate in 2007, his first year with the Cubs. He appeared in 149 games for the Cubs, with the majority of his time at second base, but filling in at times all over the field. DeRosa batted .293 with 10 home runs and 74 RBIs. DeRosa on February 23, 2008, was taken to a hospital after having trouble breathing and having a rapid heart beat. On February 28, 2008, DeRosa had a successful heart procedure at Northwestern Memorial Hospital to correct an irregular heartbeat. His heart procedure earned him the nickname of "the Pulse", which was also the name of his blog on www.cubs.com. DeRosa had a very successful 2008 season, where he helped the Cubs to the best record in the National League. He had career highs in home runs with 21 and RBIs with 87. On December 31, 2008, DeRosa was traded to the Cleveland Indians for minor league pitchers Jeff Stevens, Chris Archer, and John Gaub. Playing third base for the Indians, DeRosa collected his first hit with the Tribe on April 10 and his first home run on April 12. In addition to playing 3rd base for the Indians, he also spent time at first base and in the outfield. Many early-season injuries to Indians regulars caused DeRosa to be moved around the field and the batting order throughout the season. In spite of this, he was on pace to make 2009 his most productive season yet. He received a standing ovation from Cubs fans when the Cleveland Indians played at Wrigley Field on June 19. The fans applauded him, an opposing player, in an at-bat against their home team in a tie game. On June 27, 2009, DeRosa was traded by Cleveland to the Cardinals for relief pitchers Chris Perez and Jess Todd. He spent some time on the disabled list with a wrist injury, and underwent surgery on October 26 to repair a torn tendon sheath. 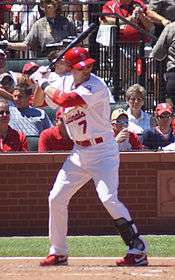 DeRosa filed for free agency for the 2010 season, turning down the Cardinals' offer of salary arbitration. On December 29, 2009, DeRosa signed a 2-year, $12 million contract with the San Francisco Giants. At the beginning of the 2010 season, DeRosa immediately went into a prolonged slump, batting only .194 in his first 26 games, with only four extra base hits and 10 RBIs. Experiencing numbness in the fingers of his left hand, he underwent a medical examination on May 11, 2010, and found that the wrist surgery in 2009 had been a "total failure". On June 22, 2010, Giants officially announced DeRosa incurred a season ending surgery. Despite his wrist, the Giants went on to win the World Series that year. DeRosa began the 2011 season reportedly healthy and ready to make an impact on the field. However, on May 18, 2011, he reinjured his surgically repaired left wrist on a checked swing so badly that many speculated his career was over. But DeRosa, who had torn a wrist tendon on that checked swing, reworked his swing to become more of a singles hitter and returned to the Giants on August 4, 2011, after a rehab assignment with the San Jose Giants and the Fresno Grizzlies. On December 22, 2011, DeRosa signed a one-year deal with the Washington Nationals. On April 29, 2012, DeRosa was placed on the 15-day DL with an oblique strain to make room for first-base/outfield prospect Tyler Moore. He was hitting .081, or 3-37, with 2 RBI in 13 games. He returned from the disabled list on September 1. Despite DeRosa's limited playing time, he became an important mentor for his Nationals teammates, many of whom are much younger. The day after the Nationals lost the game five of the divisional series to the St. Louis Cardinals reporters asked him if he was going to put a uniform on again (to retire) and DeRosa stated "I don't know if I'm okay with that yet." On January 22, 2013, DeRosa signed a one-year deal worth $775,000 with the Toronto Blue Jays, with a $750,000 club option for the 2014 season. Pitcher Sam Dyson was designated for assignment to make room for DeRosa. In a game against the Houston Astros on July 27, 2013, DeRosa hit his 100th career home run, a solo shot to lead off the second inning. In August, DeRosa was placed on revocable waivers and claimed by an unnamed team on August 7, but no trade occurred. On the season, DeRosa was used most as a pinch-hitter, but also started some at third base, second base, first base and designated hitter. In 88 games in 2013, DeRosa hit .235/.326/.407 with 7 HR and 36 RBI, including hitting .286/.448/.476 with 1 HR, 8 RBI and 7 BB as a pinch-hitter. 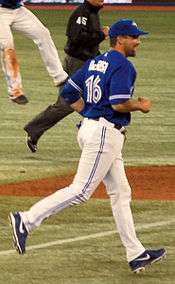 In late October, the Blue Jays exercised their $750,000 option on DeRosa for the 2014 season. 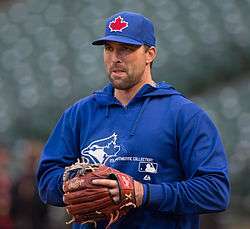 On November 12, 2013, the Blue Jays announced that DeRosa had informed the team he was retiring. He retired to accept a position as a studio analyst with the MLB Network. DeRosa is married to former model Heidi Miller, with whom he has a daughter, Gabriella Faith. After signing a 2-year contract with the San Francisco Giants, DeRosa moved to Hillsborough, California, and currently resides in Atlanta, Georgia. ↑ Mark DeRosa player profile. Accessed December 19, 2006. ↑ Wallace, William N. (1994-09-25). "COLLEGE FOOTBALL; Penn Holds Its Ground To Edge Dartmouth". New York Times. Retrieved 2008-09-23. ↑ Caldera, Pete. "DeRosa re-invents himself with Rangers", The Record (Bergen County), November 13, 2013. Accessed December 3, 2013. "DeRosa, a Carlstadt native and Bergen Catholic grad, had been a guest analyst for MLB Network during this past postseason, as well as in 2011." ↑ Schwarz, Alan (June 1, 2006). "Businessperson's special". Wharton Magazine. Retrieved 2010-04-15. ↑ "Ivy League Sports". Ivy League Sports. Archived from the original on January 2, 2010. Retrieved 2010-04-15. ↑ Muskat, Carrie (2008-01-16). "DeRosa concerned about playing time". MLB.com. Retrieved 2008-09-23. ↑ "Piniella: DeRosa 'doing fine' after experiencing irregular heartbeat". ESPN.com. Associated Press. 2008-02-23. Retrieved 2008-09-23. ↑ Jesse Temple (June 19, 2009). "Wood, DeRosa return to Wrigley Field". MLB.com. Retrieved 2010-04-15. ↑ "Cards acquire Mark DeRosa from Indians". Stlouis.cardinals.mlb.com. 2009-06-27. Retrieved 2010-04-15. ↑ Leach, Matthew. DeRosa to decline arbitration, MLB.com. Published December 7, 2009. Accessed December 8, 2009. ↑ "Comcast SportsNet – Authentic Bay Area Sports". Csnbayarea.com. December 28, 2009. Archived from the original on January 1, 2010. Retrieved 2010-04-15. ↑ "Giants Sign IF/OF Mark DeRosa to Two-Year Contract". MLB.com. 2009-12-29. Retrieved 2010-04-15. ↑ "DeRosa calls wrist surgery 'total failure'". MLB.com. 2010-05-11. Retrieved 2010-05-12. ↑ "Nationals, Mark DeRosa agree to contract". NBC Sports. December 22, 2011. ↑ Wagner, James (October 11, 2012). "Mark DeRosa read Theodore Roosevelt speech to Nationals before Game 4". The Washington Post. Retrieved 12 October 2012. ↑ Wagner, James (September 9, 2012). "Mark DeRosa talks with Stephen Strasburg: 'I don't want to see him beat himself up'". The Washington Post. Retrieved 12 October 2012. ↑ "Blue Jays sign Mark DeRosa to one-year deal". TheStar.com. January 22, 2013. Retrieved January 22, 2013. ↑ Blontz, Blaine (January 22, 2013). "Toronto Blue Jays sign Mark DeRosa; Designate Sam Dyson". MLBDailyDish.com. Retrieved January 22, 2013. ↑ Silva, Drew (August 7, 2013). "Blue Jays utilityman Mark DeRosa claimed off waivers". NBCSports.com. Retrieved August 7, 2013. ↑ "Blue Jays veteran infielder DeRosa retires". TSN.ca. November 12, 2013. Retrieved November 12, 2013. ↑ Lott, John (November 13, 2013). "Retired Blue Jay Mark DeRosa puts down his bat and picks up a microphone". The National Post. Retrieved November 13, 2013. ↑ Baldassaro, Lawrence (2011). Beyond DiMaggio: Italian Americans in Baseball. University of Nebraska Press. p. 336. Retrieved December 2, 2013. Wikimedia Commons has media related to Mark DeRosa. Schwarz, Alan (2008-09-23). "Blue-Collar Ivy Leaguer Is Cubs' Secret Weapon". New York Times. Retrieved 2008-09-23.